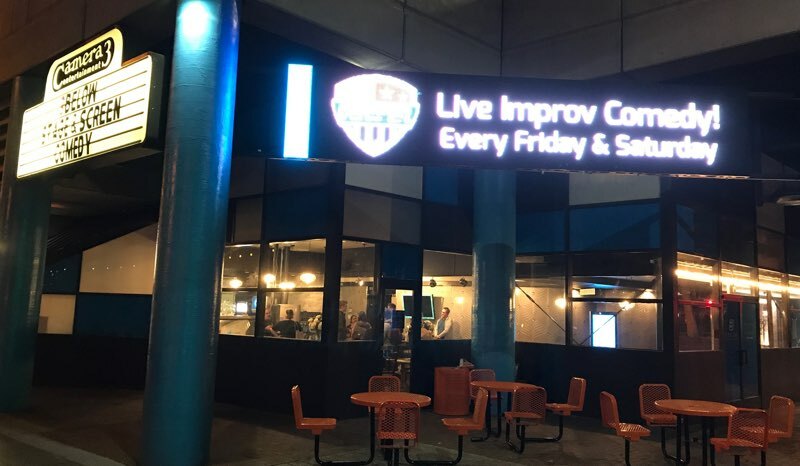 Whether it's a block of seats at a ComedySportz® Match, a Private Event just for your group or a customized improv workshop, CSz San Jose has your needs in mind. CSz San Jose has hosted and toured to private groups since 1987. We offer a 10% Discount for Groups of 10 or more! Group Rate seats are reserved seats, not general admission. Your group will be seated together. There are no refunds for unused tickets so make sure your numbers are accurate! If you need to add more tickets to your order later, just give us a call. We'll place your additional seats as close to your group as possible, space permitting. We can hold a block of tickets for you group up to 72 hours before the scheduled show. Gift certificates are available for your honored guests. We sell them in any denomination, beginning at $15. The CSz San Jose Arena seats 100 people and is available any time except during primetime Friday and Saturday evenings. We have a great sound system and our custom video screen application available to support your event. Need details? Call us at 408.985.5233 ext. 1 and we'll let you know what the options are. The CSz Arena has seating for up to 100 people. and can be configured for performances, meetings, seminars or any number of uses. Our Arena also features a full sound system (Computer audio and audio inputs, wireless and wired microphones) as well as two TV screens that can show video or powerpoint/Keynote for presentations. For performances, the Arena also features a full warm-up room. We can provide staffing, box office and technician. We're located inside Camera 3 - 288 S. Second St. at the corner of Second and San Carlos in downtown San Jose. Parking is available in the 2nd and San Carlos Parking Garage located directly above the theatre. Every year we play at dozens of schools and colleges in California, bringing our fast-paced, clean, funny improv show to students (and sometimes their parents). ComedySportz® is perfect for college shows because we tailor our show to you. We ask the audience about their classes, campus and dorm life, and then play scenes and games incorporating that information into the show. It's not just another show to watch - it's a show about your school. Call us at 408.985.5233 ext. 1 or email info(at)cszsanjose.com to learn how ComedySportz® can rock the house at your next college function. I thoroughly enjoyed the show last night at Saratoga High. I was so impressed! You got talent! Call us at 408.985.5233 ext. 1 or email info(at)cszsanjose.com to learn how ComedySportz can be a positive, fun, learning experience for your next school event. We have several options that allow us to scale a show to your event. After a brief phone conversation to assess your needs, we'll provide a customized quote with several different options. Call us at 408-985-5233 ext 1 for your customized quote. We can customize the length from 30-100 minutes. A vast majority are between 45-60 minutes. It depends on your event. You'll fill out a brief questionnaire so we can learn a little about you. Then our referee knows what kind of suggestion categories to use - your group makes all the suggestions, and the show tailors itself to your group. It's simple, elegant and it works every time. The Full Court is our most popular road show - 2 teams of 3 players, referee. It clocks in between 50-60 minutes. It's a highly energetic competition between the Red and Blue Teams, with the ref getting suggestions from the audience, timing games and calling fouls. The audience supplies all of the suggestions, votes for the funniest team in each round and awards points. The Half Court show is one team of three players, and a referee. There's no competition between teams, (and no fan voting or points) but the ref still calls fouls and we play the games with ComedySportz® energy and style. It's a little less splashy than the Full Court, but just fine for audiences up to 100 (or more, depending on your event.) We do a lot of Half Court shows, too. Half Courts can last between 30-50 minutes. An exhibition may be a two, three or four player show that lasts 20-40 minutes. Exhibitions are usually designed for special situations, such as private parties in a home, very small audiences, unusual locations or United Way kickoffs at companies. We may not offer the Exhibition shows on certain dates, in certain locations, or for certain types of functions. Great idea! Let's discuss this by phone. If we're appearing at your meeting or convention, consider a ComedySportz Teambuilding or Leadership breakout. Yes. We've played from Coast to Coast. Outside of the Bay Area, we do add travel charges to help offset room, board, transportation and extra player time. Do seat your audience as close to us as possible. Connecting with an audience across the dance floor is possible, but difficult and we can't guarantee the effectiveness of the show if we are disconnected from the audience..
Sure. We can do a private event anytime during the week, depending on schedule. Or you can buy out the house on a Friday or Saturday night. We accommodate up to 100 people. Note that there are no accommodations for food and drink outside of the normal concession items available in the lobby. If you want to combine a sit down meal with our show, we'll be happy to provide you with a list of other venues where we've performed before. We ask for 12' by 16'. A raised stage is necessary if you have more than 100 people at the show. We also need access to one electrical outlet, 7 chairs for a Full Court, 4 for a Half Court, and a clean, secure place for warm-ups. Yes, a very good one, featuring wireless microphones and speakers. Our systems play well up to 800 people at dinner table rounds and thousands in theatre-style seating. We know the systems and our needs cold, so you don't have to worry about it. We vastly prefer using our own equipment, even if you have a system or the venue has one. If we're setting up our sound system we usually need about 60 minutes, unless we run into a challenge. We prefer to arrive about an hour before our show and set up; we tear down immediately after our show. That takes less than 10 minutes in most cases. Some folks like us to set up several hours in advance of the show. In some cases, there is an extra charge of $150-$300 to pay our players for an extra call or "sitting around time". We email you our 1 page agreement and an invoice. You sign it and e-mail it back to us. That's it. We don't "pencil in" dates. We ask for a 50% deposit with the balance due the day of the show. By check or credit card. We accept Visa, MasterCard, AMEX and Discover. We have a secure online portal so you can even pay online at your convenience. Extra fees are stupid. We'll let you know all of the fees in advance when we send you a price quote. Yes. Check out our graphics and photo resource page. It has all of our logos in web and print formats, as well as a growing number of photos you can use. If you have a location, that's great! If not, we've performed in over a hundred different spaces in the Bay Area. Ask us. This is important for us to know in order to schedule performers or instructors. To book your next show, or for more information, contact us at 408.985.5233 ext. 1, or fill out our contact form.